Nursing mothers devote extra time and energy to providing their babies the best nutrition possible. Breast milk is full of antibodies that formula does not contain. Mothers who choose to breast-feed need to pay extra attention to their diet, while formula-feeding moms do not. This is because the foods and beverages that a nursing woman consumes transfer through her breast milk and affect her baby. 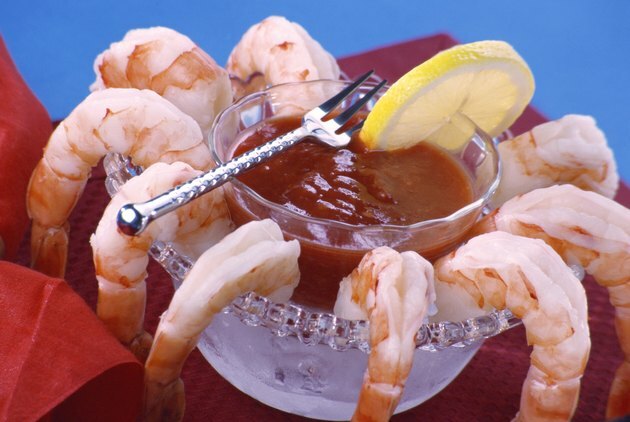 The safety of seafood during nursing can be confusing, yet the guidelines are specific. Some types of seafood contain high levels of a chemical called methylmercury. While the full effects of methymercury on young babies are not yet understood, the chemical does pose a risk to the development of babies. The Food and Drug Administration states that methymercury found in fish can harm a baby's central nervous system. Kelly Bonyata, International Board-Certified Lactation Consultant, states that shark, swordfish, king mackerel and tilefish are the highest in methymercury. This is because these types of fish contain more fat and the methymercury is found in the fatty tissue. Avoid these types of seafood while breast-feeding. Seafood is a healthy type of food that should not be avoided entirely, even while nursing. According to the FDA, fish and shellfish are a good source of protein and omega-3 fatty acids, which contribute to healthy brain development in an infant or child. Shrimp, pollock, catfish, canned light tuna and salmon are all low in methymercury and healthy to consume while breast-feeding, according to the FDA. While pregnant women are often told to avoid raw fish, such as sushi, Bonyata states that the risk of bacterial infection is not a great concern for nursing mothers, because the baby is no longer connected via the umbilical cord. Therefore, raw fish is generally safe to eat while nursing. Even when consuming the types of seafood that contain low levels of methymercury, you should still limit your intake of seafood while breast-feeding. The FDA recommends that nursing women eat no more than 12 oz. of low-methymercury seafood, like shrimp and catfish, each week. This translates into roughly two to three small servings of fish in a week. The recommendation is based on averages, however, so if you consume slightly more fish one week, you can restrict your consumption of seafood the next week. Can I Eat Fish Every Day & Still Be Healthy? What Seafood Can You Eat When Pregnant?